Do you love to golf? How about a nice game of Tyrannian Mini Golf! 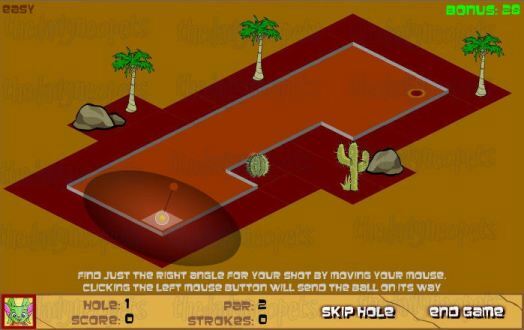 In this game you can chose between three characters to golf with. Watch out for sandpits, lava, and even fans! So get your golf club and get ready to putt! First you choose your character. You can choose a Chomby who is labeled as 'weak stroke', an Acara who is called the 'perfect putter', or a Lupe who is called the 'Hard Hitter'. There is also a secret character available! To get the secret player who is The Phantom Orange-Shirt Guy (TPOSG), hit your tab button four times then hit spacebar. You can also just click the Lupe's eye to use TPOSG as your character. After choosing your character you may now chose between three balls. The balls are the dung ball, the wood ball, and the stone ball. The dung ball is the lightest in weight and the stone is the heaviest. Finally you get to choose what you want to play! You can play the front nine holes, the back nine holes, or all 18. The more levels you play the more chance you have to earn points. So now you're ready to play! First we will cover some of the basics of golf. If it only takes you one putt to get the ball into the hole, it's called a hole in one. Par is listed on each hole, if you take that many putts to get the ball in the hole then you shot par. Par is simply how many they think it should take you to get the ball into the hole. A birdie means it took you one less putt than par for that hole. A bogey means it took you one more putt than what the par is listed as on that hole. A double bogey is two more putts than par, and an eagle is two less puts than par. A hole in one is, quite obviously, finishing a hole in one putt. You get ten putts to get the ball into the hole. After each hole you will see your score card. The card lists each hole, or level. Under the hole number it shows what par is for that level. Under that it shows how many putts or strokes it took you to get the ball into the hole. Next you will see your score, your score is higher when it takes you less putts to get the ball into the hole. After your score you will see 'bonus', the bonus is based on your time. When you start each hole you have 30 bonus points, the points will go down 1 point per second you take. So the faster you finish the hole the more bonus points you will get. 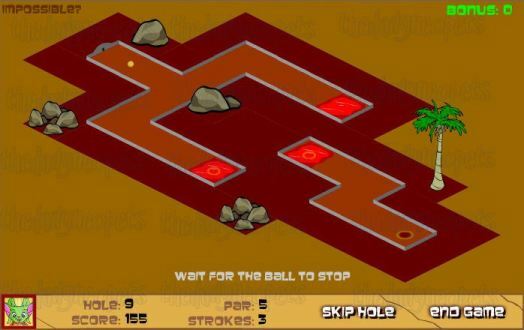 If you take more than 30 seconds to finish the hole you will receive no bonus points. NOTE: There's an easter egg on the scorecard: Keep mousing over (on and off) the Continue button quickly, and it will explode. Remember that this will force you to click the End Game button and, obviously, end the game. Now for the actual game play! There will be a circle around your ball, the bigger the circle the harder you are going to hit the ball. The red circle at the end of the black line coming off your ball shows where you are going to hit the ball. Aiming is the most important part of this game. The better you aim towards the hole the fewer strokes you take, which gives you more points. Once you have the strength you want to hit the ball and have where you want to aim it, click the left mouse button to hit the ball. When playing the game try to find the best place to aim to get the ball into the hole in as little putts as possible. Once you have the best place to aim, use that every time so you can get more holes in one and pars. There is no guarantee that you will get the shot right every time, but you chances will greatly increase once you have pinpointed the best place to aim. Many times a straight shot to the hole isn't the best shot to take, rather bouncing your ball off the wall might work better. 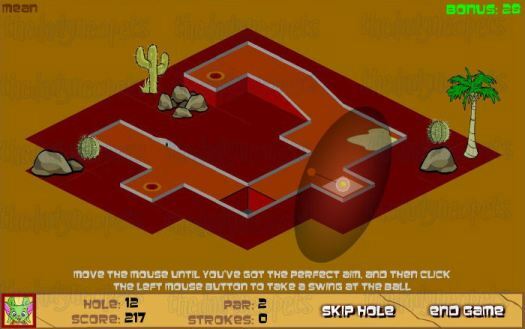 In some of the levels you will see no direct path to the hole, such as hole 9. If you look closely the lava has a tiny circle in the middle of it, not all of the lava, just one of them. This is actually one of your holes! On hole 12 it appears that there is a huge square hole that is in your way. That isn't the case it's actually glass so you can hit your ball right over it to the hole! Going this way will take fewer putts and increase your score for that hole. This game can be difficult to play at first. 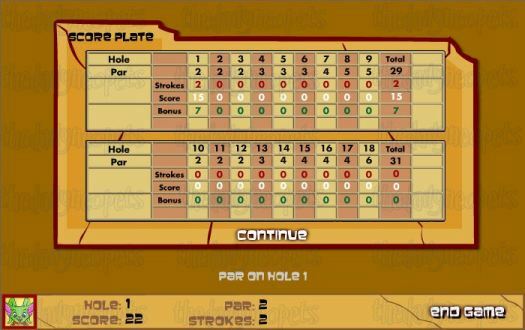 Once you figure out where to hit your ball the game becomes much easier and can earn you a lot of Neopoints. Remember to find the best shot and use that whenever you play! Have fun hitting your ball around all those holes!